“No, Eddie, you can’t have any of these cookies,” Edith Marble said as she carefully placed the decorated Santa cookies in a plastic container putting wax paper between each layer. She reached up and pushed a wisp of gray hair out of her eyes. “They’re for Sarah’s Christmas Open House tonight, although why she’s having it this early with Thanksgiving only just over a few days ago is beyond me. Next thing you know she’ll be having it before Thanksgiving,” Edith grumbled. After just putting on a big Thanksgiving dinner for her family as well as her brother and his whole family, Edith didn’t feel like making Santa cookies with leftovers from Thanksgiving still in her refrigerator. “I don’t think I’d like that, either,” she said, commiserating with him. “That’s tonight, huh?” He groaned and threw up his hands. “Hordes and hordes of more people and my driveway will probably be blocked like usual. It’s just too much. How can a neighbor put up with all this?” He waved his hand at the Clauson home, shook his head and went back to plowing the rest of the circle so Edith could get in the Clauson driveway. Several tire tracks in the drive showed others had already been in and out since the snow started falling last night. She pulled up to the garage and carried the container of cookies carefully to the side door of the garage and went in. The car was gone so Carl must have gone somewhere, she thought. A yellow cat came up to her meowing piteously. She knocked on the door leading into the house, waited a while and then knocked again. When Sarah didn’t come, Edith tried the door. It was open so she walked in and up the two steps leading to the kitchen with the cat following. “Sarah,” she called out. I’ve brought the cookies I promised.” She looked around the kitchen. There were Christmas decorations everywhere, and most were of Santa Claus. She called out again. “Sarah! It’s Edith. I’m here with the cookies.” When there was still no answer, she set the container on the kitchen counter and went into the dining room. Light from the windows showed more Santa Clauses everywhere around the room and a table centerpiece with Santa and his sleigh and reindeer. “Sarah?” she called again. Trepidation filled her as she started wandering through a house filled with Santa paraphernalia and even a life sized Santa which spooked her when she walked into the hall leading to the bedrooms. It was in the master bedroom Edith found Sarah dressed in hunter green stretch pants and a red sweat shirt with a picture of Santa on the front. She was lying on their bed on a bedspread with red poinsettias on a white background. Around her neck was a Christmas scarf pulled tight enough to strangle her. With Sarah’s eyes bulging and her tongue protruding, Edith didn’t need to feel her pulse to know she was dead. “Oh no, Sarah. Who could have done this to you?” She felt the tears coming along with a heavy pressure in her chest. She left the room and went to the kitchen phone to call 911. She knew enough to take a kitchen towel with Santa’s beaming face on it to pick up the phone and dial the number. She stood at the kitchen window watching, waiting and crying until a police car pulled in and she saw Sheriff Braddock and his large sized deputy climb out. When she saw them heading for the front door, she wiped her eyes with the dish towel she still held and went to the door. Using the towel she unlocked the front door and opened it. She nodded. “Come in Sheriff.” She nodded at the deputy. Edith swallowed. “Unfortunately, yes.” He didn’t need to remind her of the other unfortunate times. Tears started to fill her eyes and she blotted them with the Santa towel. She turned and led him down to the bedroom. “Who is she?” Sheriff Braddock asked in a softer voice as he looked at the body with the cat now curled up beside her. He frowned. “Mrs. Santa Claus?” He raised his eyebrows and Edith could tell from the look he gave her he was thinking “Oh, really? What kind of nonsense is that?” but he refrained from any sarcastic remarks although his deputy snorted and rolled his eyes. He gave a brief nod. He bit his bottom lip and looked a little abashed. “She was having a Christmas Open House tonight, and I said I’d bring some extra cookies. She usually gets a lot of people at these things,” Edith said. “Did you touch anything?” he asked. “Stuff it, George. Now isn’t the time to act like you’re so important,” Edith scowled at him. Edith went into the kitchen with George and told him what had happened. That silenced him, but she wondered if he knew about Sarah and was using his blustering to cover up the crime. He had a reason and quick and easy access to the house. Soon the coroner and the crime scene team arrived. If she hadn’t known Sarah, she would have liked to go in and watch them, not that Sheriff Braddock would have allowed her to watch. So she and George sat in silence until a man with a snowy white beard and Santa hat came bursting in the back door. “Dead? What do you mean? She was fine when I left,” he said shaking his head in disbelief. “Where is she? I don’t believe it. I want to see her.” He started to leave the kitchen when Sheriff Braddock came towards him. “It’s the coroner, Sir.” He turned and led Carl down the hall so he could identify the body. Edith heard his howls coming from the room, and she started tearing up again. Soon Sheriff Braddock brought him back to the kitchen and told him to sit and wait while they finished up. He looked at George and told him to wait, too. He ignored Edith. “We’ll find out who did this, Mr. Clauson,” he said. Edith looked at him and saw he meant it. He would, too, with her help, of course. She sat down by Carl and held his hand. Remembering the death of her husband, she knew no words could console him right now, but his daughter should probably be called. “Carl, do you want me to call Nancy?” she asked. “I don’t know. She shouldn’t see her mother like that,” he said. “I think she’d want to be here with you,” she said softly. Edith phoned their daughter and as gently as she could she told Nancy about her mother. Sarah’s body had left in the ambulance and the crime scene techs had just started when Nancy and her husband, Alex, arrived. Edith saw him look around for a private place. She knew there weren’t any doors between the kitchen, dining room or living room. The bedroom where she was murdered wouldn’t be an option and the only other bedroom was filled with Santas and a Christmas tree with no place to sit and take notes. Sighing, he said. “I guess I’ll take you one by one into the living room and Deputy Rolland will take notes. I’d like to start with you, Mr. Clauson. Mrs. Marble I’ve already talked to you so you can stay or leave.” He ushered Carl to the living room and the cat followed. Edith chose to stay. She’d do what she could to comfort Carl and his daughter as well as eaves-drop a little to listen for clues. She figured Sheriff Braddock could use her help especially since she knew everyone here. “I’m sorry, Nancy, for your loss. Sarah was a special person. I’ve always liked and admired her,” Edith said. She didn’t mention she thought both Sarah and Carl took the whole Santa thing way too far and thought it was totally ridiculous. Nancy nodded and sniffed. “I just can’t believe anyone would harm my Mom.” Her voice quivered. Edith glanced at Alex. He still had his heavy red plaid coat on. He’d moved closer to the door between the kitchen and dining room. He hadn’t said much since they’d arrived, and she could see he was listening. She frowned. He should be comforting his wife and not eaves-dropping on what was going on. Actually, I should be doing that, she thought, if I’m to help Sheriff Braddock, but she didn’t know how she could suggest Alex sit down and then take his listening place. She looked at George. He sat fidgeting a little in his chair and kept glancing at his watch. “Have an appointment somewhere, George?” she asked. Maybe he wouldn’t, Edith thought, but then he does hate having all those lights, music and Christmas displays attracting crowds of people. He could have come to complain and lost his temper and killed her. Still, she acknowledged to herself that seemed unlikely. He’d be more likely to file a nuisance complaint. But then she remembered he’d said he had and no one did anything about it. After Carl returned, Deputy Rolland came for George Jones, and Carl sat down and reached over to hold Nancy’s hand. “How about if I fix some coffee?” Edith asked. Carl shrugged and said, “Okay” but his tone of voice didn’t suggest any interest in it. “Where did you go this morning, Dad?” Nancy’s teary blue eyes looked at him. “What are they?” Edith asked. “Belsnickle means trickster in fur sort of like woodland Santas. The ones worth the most money are old German from the 1800s,” Carl answered. “Every year you have this Christmas Open House with people coming in and out,” she said. Edith checked to see if it was done, then filled a mug for him and placed it in front of him. He muttered a thank you, before adding three heaping spoons of sugar and stirred it. He sneezed before he picked up the cup, and looked down at Rudolph who had followed Edith. “Damn cat,” he said. Alex and Nancy exchanged glances and then he got up and headed for the other room. Edith quickly poured two cups of coffee for Nancy and Carl. As unobtrusively as possible, she slipped over to the open doorway to listen to the interrogation of Alex in time to hear him say he’d gone Christmas shopping. When questioned about shopping that early in the morning, he said Wal-Mart was open twenty-four hours and he wanted to beat the crowds. “You can check the trunk of my car and see the gifts in there,” Alex said. Carl and Nancy stared at her for a minute. “You can’t have thought either one of us would have killed Sarah.” Carl scowled at Edith. When Alex returned, Edith got up and headed towards the living room. Deputy Rolland tried to stop her saying the sheriff wanted to talk to the daughter next, but Edith told him she’d only be a minute. “Ahh, but I need to tell you some things so you head in the right direction.” She smiled at him and sat down on a chair opposite him. She took a moment to glance at several of the curio cabinets filled with Santas before returning her attention to him. Sheriff Braddock thought about this for a moment and Edith went on. She nodded. “But it would have to be a thief who was quite familiar with the collection and the worth of these particular Santas, and I think I know who it was.” She leaned forward and whispered the name. The call came from Sheriff Braddock later that afternoon. “We arrested the son-in-law,” he said. “So he was the one who put the ad on Craig’s List and waited for the right person to go for the bait,” she said. “Right. We found the Belsnickles in large plastic crates in his garage,” Sheriff Braddock said. “That was dumb. I supposed he was going to remove them before long,” she said. “How sad. Poor Nancy. Poor Carl. All for a gambling addiction.” Edith’s heart ached for them. 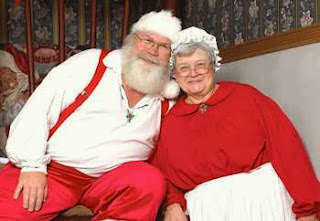 *Disclaimer - To my knowledge the real Mrs. Santa Claus is still alive and well at the North Pole. Long may she live. What a delightful and timely story, Gloria. Thanks for such a terrific Christmas gift. Also, congratulations on the publication of your third Catherine Jewell mystery. Best wishes for continued success with your series. Thank you, Paula. Now it's starting all over with a new book. I've been taking a bit of a breather before actually starting it although I do have the plot idea. Great story, and I appreciated your disclaimer at the bottom. I enjoyed it! I just finished reading the short stories in The Killer Wore Cranberry (I won the copy this site was giving away) I was reading one a day, and was thinking I would miss them. This one filled in perfectly! Great story, Gloria. Merry Christmas. KM, I'm glad you enjoyed the story. It's the third of written using this protagonist, Edith Marble. Keep reading a new one every week until the first full week of January when we go back to blogging. Thank you, Carol, and Merry Christmas to you, too. Great Story, Gloria, for the holidays. Thank you, Pat. I'm glad you liked it. Hi Gloria, Just had time today to sit down and enjoy your story! I loved Miss Marble/Marple - hope to see more stories about her. Shari, actually this is the third one I've written with her. None of the others are published yet, but someday I may have enough stories about her to put up an anthology entitled "Edith Marble Investigates." The first stories were written for the Al Blanchard Crimebake contests. I enjoyed your holiday story, Gloria and the disclaimer. Also, congratulations on publishing your third Catherine Jewell book! It's on my holiday wish list. Thank you, Kara. I'm glad you liked the disclaimer. :-) I also hope you enjoy LADIES OF THE GARDEN CLUB. Sob! Well-told story . . . and thanks for final reassurance of Mrs. Claus. Merry Christmas!